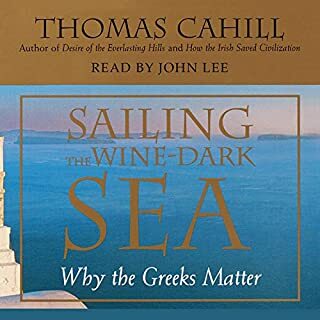 Since I gave such a cranky review of Don't Know Much About Mythology...I need to express my enjoyment of Cahills Sailing the Wine Dark Sea. You know the juicy parts of Greek history you were sure your teacher was not discussing? They were tucked away here in Cahills book. No, I did not find the book enjoyable for it's more salacious chapters. I found it enjoyable because it was written with the passion of someone who really enjoys history and sharing. I thought the reader was pleasant to listen to also. Whether it's the adventures of Greek gods and goddesses or Norse trickster tales, we all love to hear a good story. 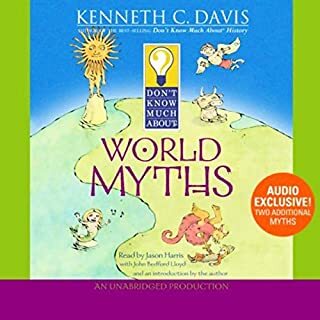 Best-selling author Kenneth C. Davis gives readers a taste of these enchanting myths and the diverse people who tell them. In his trademark question-and-answer style peppered with entertaining sidebars and quotes, he also shows how almost every civilization's mythology shares common themes. This reminded me of that public school garbage in garbage out kind of learning. No soul. If a child was to be inspired to learn more about mythology it's not going to be from this linear recitation of dates and spockian facts. Just my disappointed opinion. Maybe I Don't Know Much About Teaching Kids.